When it come to your business you want to make sure you have everything in order for your staff as well as your clients. Every service needs to run smooth from computers to copy machines to conference calls. Well, don’t worry for FreeConference.com has the right conference service that will meet all your conferencing needs. FreeConference.com is now ready to help take your conferencing calls to a new level with their improved services. Your company can experience this system via HD audio, free video conferencing, unlimited conference calls, free international numbers and even screen sharing. 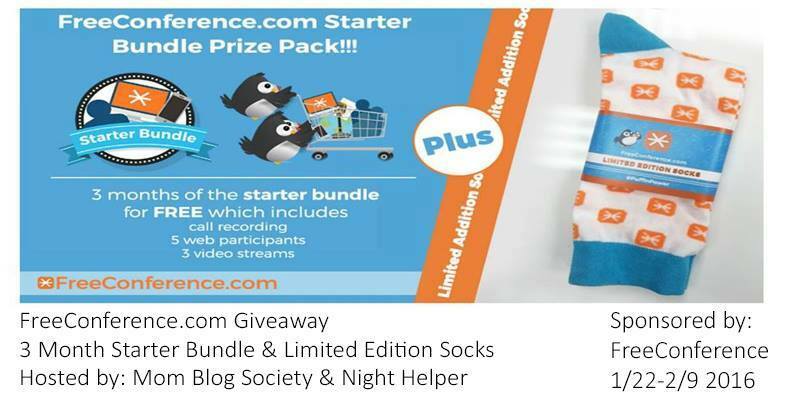 FreeConference.com want your company to have a chance to experience their new upgraded features that's why their offering this great giveaway along with a pair of Limited Edition Socks. You can read more about the review here! Disclosure: We reserve the right to make revisions, to cancel, or suspend this contest for any reason. We are not associated with any of the companies named above. The odds of winning are based on the number of entries received Open to the US 18+ only. Confirmed Winner(s) (by Random.org) will be contacted by email. Winner(s) have 24 hours to respond before a new winner is chosen. No purchase necessary. Void where prohibited by law. The sponsor(s) will be responsible for product shipment to winner(s) of this giveaway. Mom Blog Society (and any other blog participating) is not responsible for product shipment/delivery. This event is in no way administered, sponsored, or endorsed by, or associated with, Facebook and/or Twitter, Google, Pinterest. This disclosure is done in accordance with the Federal Trade Commission 10 CFR, Part 255 Guides Concerning the Use of Endorsements. Entrants must only enter with either one email address, IP address and/or Facebook account, anyone found violating these rules will be disqualified. It is at the sole discretion of the admin of the giveaway if the winner has met the rules or not.